When planning a social gathering or birthday party, you can include some games and contests to keep your guests entertained. From relay races to games with hula hoops, adults and children of all ages can enjoy competitive contests. Awarding prizes to winners will entice everyone to play along. With a few supplies, imagination and some creative ideas, you have all you need to get started creating fun games and contests. Create a nature scavenger hunt for all ages. Divide the players into teams of three or four players. Make a list of 20 items in nature, such as a brown rock, green leaf, purple flower or black twig, for each team. When you say, “Hunt,” the players must find the items as quickly as possible. The first team to find 15 of the 20 items wins the scavenger hunt. For another scavenger hunt, hide small pieces of wrapped candy over the play area. Give each player a small plastic bag. The player who finds the most pieces of candy wins the hunt. For a funny relay race, try a chimp race. Divide the players into two teams. Mark a starting line and a finish line 20 feet apart. Have all the players line-up at the starting line. When you say, “Race,” the first two players in each team must grab their ankles and race to the finish line and back. Each player must do the same thing. The first team to finish the relay wins the game. For other relay race ideas, players can crab walk -- down on all fours with your back facing down -- or bear walk, where you are down on all fours with your back facing up. Have a hula hoop contest for your guests. 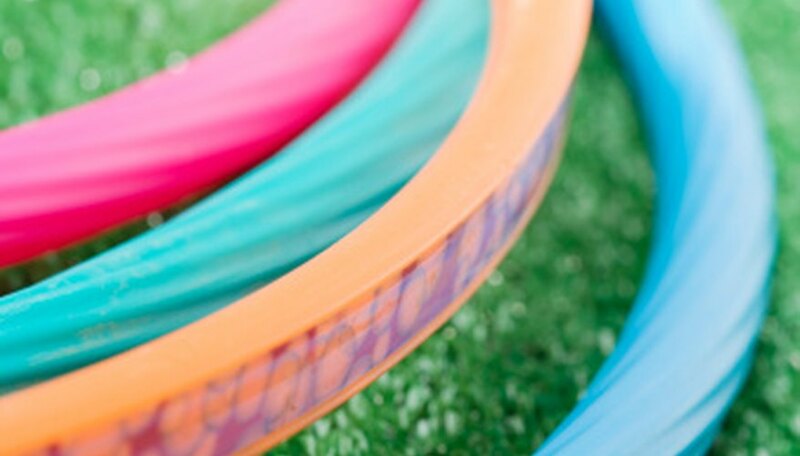 Give each guest a hoop and see which player can hula hoop the longest. If you do not have enough hula hoops for everyone, simply time each player. For another hula hoop game, hang the hoops from a clothesline or tree. Mark a line 10 feet from the hoops for children and 20 feet for adults. The players must try to toss footballs or soccer balls through the hoops. The player who makes the most balls through the hoops wins the game. Inflate several balloons and attach them to cork board using push pins. Have players throw darts at the balloons to try to win a prize. Place a small slip of paper in each balloon, with some that say “winner.” Award a prize to each player who pops a “winner” balloon. For another carnival game, place 10 empty plastic bottles in the shape of a pyramid like bowling pins. Have players roll soccer balls or medium-size balls at the bottles to knock them down. The player who knocks down the most pins wins the game.